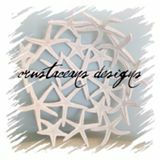 Crustaceans Designs is a web-boutique, no store front. For now, my shop is in my formal dining room. My mission is to create FUN, good quality, affordable designs, that make people HAPPY. I'm the owner/designer. I'm a Child of God, wife to Tom, doggie mommy to Katie. I'm a land locked beach baby who loves the Carolina Panthers & Va Tech Hokies. I'm a wine sipper and a pizza & beer fan!!! My husband, Tom, is my IT guy and my CFO. We've been together for 36 years, married for 30. I'm a handcrafting visionary. I inherited it from my late Mother, who was blessed with it from my Great Grandmother. Thank you for stopping by and, most of all, thank you for supporting small business.